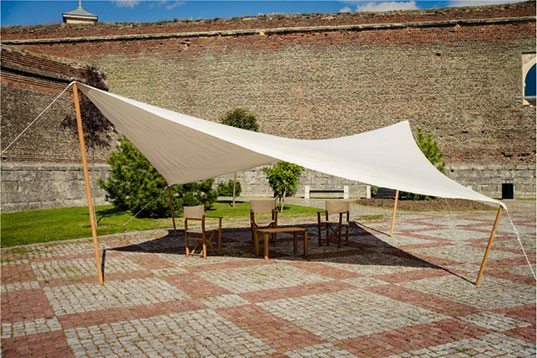 Staut structure which permits to obtain a shadow up to 36 m2 (square metres) – treated fabric for outdoor use. Wooden posts, tie-rods in playted-nylon cords, with pegs for an easy fixing. For the ground anchorage of this structure composed of 4 legs, we can provide 4 iron plates of 30 x 30 cm with wholes for fixing the gazebo on the cemented floor or 4 umbrella mosaic bases weighting 35/50 kg each. You can choose between two types of fabrics and both are waterproof. The poliacrylic fabric has a 2 year warranty, and the acrylic fabric has a 5 year warranty.